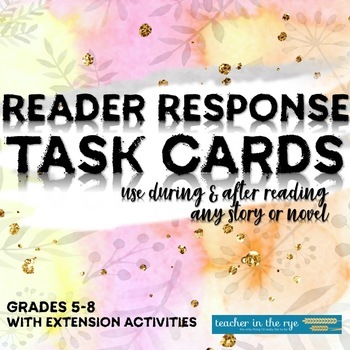 Reader Response Task Cards-Use With Any Story/Novel-Great for Small Groups! These six task cards are designed for small group work/discussion in your middle school language arts classroom! Each card has two parts: During Reading and After Reading. You can use these with any story or novel you are reading in class. There are a series of questions to use while reading. Practice speaking and listening skills, and ask students to respond orally. There are a series of questions to use after reading. These can also be answered orally, or students could answer them in a notebook. Additionally, I've included a partner activity to use with selections of reading (a chapter, for example), which you can see part of in the preview. I hope you find these questions and activities useful in your classroom. ⭐ How to Write a Character Analysis Paragraph--Planner & Outline w/ Rubric!